With a new lease on life following his second bout with cancer, as well as a new cannabis line, the marijuana icon and activist isn’t close to burning out. Squeaking springs pierce the air in the garage of Tommy Chong’s stately home in L.A.’s Pacific Palisades. 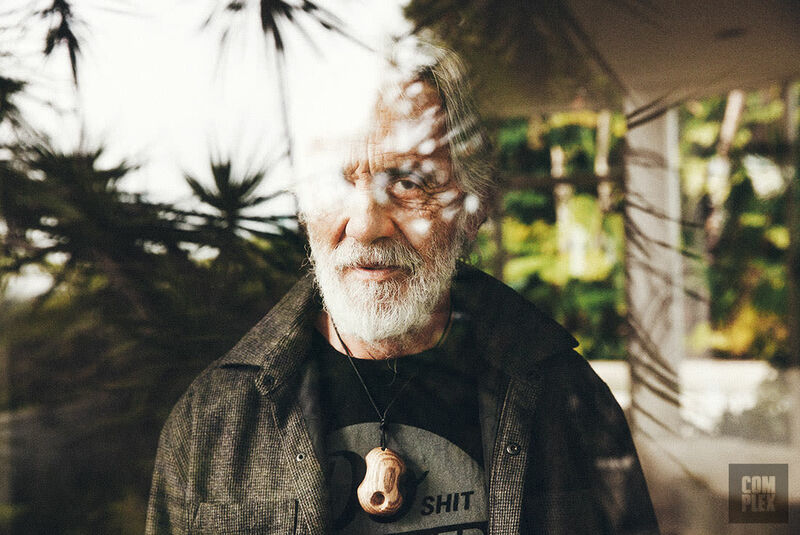 Dressed in a pair of cuffed blue jeans, a black tee, a dark grey button-up, and black and red high-top Nikes—a youthful skate style that his late guitarist friend and collaborator Gaye Delorme turned him onto—the white haired 77-year-old comedian, actor, writer, director, musician, activist, and stoner icon is illustrating how to use a funky exercise contraption he built 20 years ago to train his legs for mogul skiing. Holding his torso erect, he simulates the movement of skiing over quick, bumpy courses by pushing down vigorously on an old skateboard deck suspended from a pipe frame by four metal coils. On the floor next to him lay 40- and 50-lb. dumbbells. Chong, who started lifting weights when he was 16 and played hockey into his late 60s, says he works out every other day. Whatever else he accomplishes in his life, Thomas B. Kin Chong, born in 1938 in Edmonton, Alberta, Canada, has already made a more profound impact upon society than most people ever will. His classic 1970s and ’80s comedy albums and films like Up in Smoke (1978), Cheech and Chong’s Next Movie (1980), and Nice Dreams (1981), as one half of the duo Cheech and Chong, with Richard “Cheech” Marin, focused heavily on their enjoyment of marijuana, as well as the criminalization of the plant and related paranoia, particularly for non-white smokers (Chong is half Chinese, Marin is Mexican American). A beloved outlaw entertainer, Chong has used his platform to promote marijuana’s medical and recreational values and to fight for its decriminalization. In 2003, he became a marijuana martyr when a government sting focused on drug paraphernalia targeted him as the famous face and financier of his son Paris Chong’s glass bong and pipe company. To prevent his son and his wife, comedian and actress Shelby Chong, from being prosecuted, he signed a plea deal and served nine months in federal prison for conspiracy to distribute drug paraphernalia. He was curiously the only first-time offender caught up in “Operation Pipe Dreams” to go to prison (Chong plans to petition President Obama for a pardon). 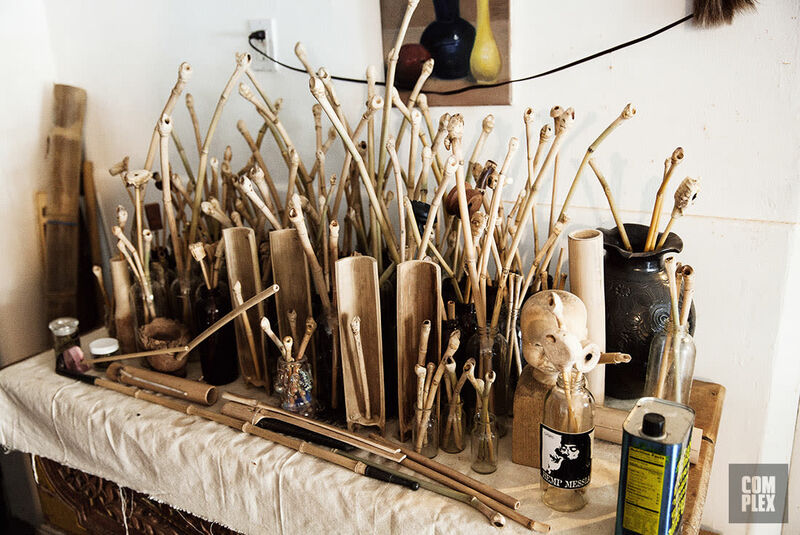 Tommy Chong has made all of these pipes by hand. He has also smoked out of every single one. A decade later, with more and more states legalizing medical marijuana, and others like Colorado, Washington, and Alaska legalizing recreational use as well, there’s a “Green Rush” to capitalize off of the changing laws, and Chong is staking his rightful claim to the industry. 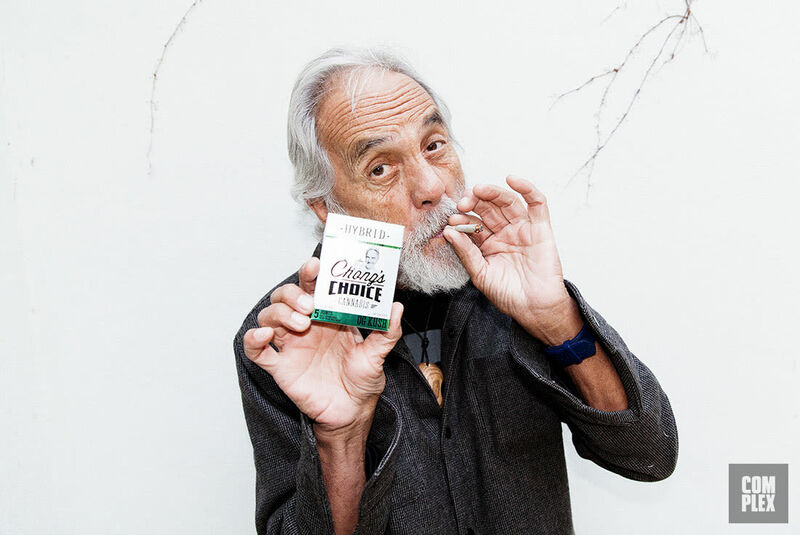 On Feb. 6, at the High Times Cannabis Cup in San Bernardino, Calif., he’s officially unveiling Chong’s Choice, a cannabis line that he’s launching with Paris, who’s CEO of their company, Chongson, Inc., Jon-Paul Cowen, the company’s president, and a network of distributors, growers, and dispensaries established in each separate state according to local laws. Chong’s is not the only celebrity stoner cannabis line—Snoop Dogg has Leafs by Snoop, Willie Nelson has Willie’s Reserve, and the Bob Marley estate has Marley Natural, among others—but it will be the first multi-territory brand. Snoop’s, for instance, is currently available only in Colorado.The initial rollout features OG Kush, a classic West Coast hybrid strain that Chong and Paris selected—hence the curatorial name—and it includes jars of buds, packs of pre-rolled joints, disposable vape pens and oil cartridges, and THC breath strips to help with your dragon breath. The plan is to expand within the year to include edibles and CBD (Cannabidiol) oil products, which can be used medically to treat various ailments with or without the psychotropic effects, as well as indica and sativa strains in all forms. Because the line represents Chong, and he’s used marijuana both recreationally and medically, as a supplement to western radiation and chemotherapy treatments, the brand naturally embraces both. Of course, with some states allowing only medical use, that makes commercial sense. But the pricing, which is still being worked out with dispensaries, reflects Chong’s determination to make the medicine affordable for all who need it.“We’re using the highest quality, top-shelf product, but we’re going to price it for everyone,” says Guy Logan, who, along with award-winning grower Brian Vecchio, co-founded and helped design the Chong’s Choice brand, and who handles California distribution and licensing. The next day, at a Sylmar, Calif., grow house that Vecchio partners in, there does appear to be no stress (and certainly no stress weed). In the lead-up to the Chong’s Choice unveiling, Chong and Vecchio are taking us on a tour of the facility and the growth cycle of some of the pungent, sticky OG Kush the brand is rolling out. The sweet smell is enough to make any smoker smile, but it’s not the only reason the promotional push has a euphoric quality for Chong. After all, he lived through the Dark Age of dope, and is finally participating in the Enlightenment.“We spent a lifetime hiding and worrying about being busted, the paranoia, and all that,” he says. “It’s just nice, now, we’re all eating at the big table. We aren’t at the kids’ table anymore. I like that. Right now, as an outlaw comedian, now that we are in Target on T-shirts, it’s like we are respectable. Little kids can come up and be like, ‘I got your T-shirt.’”While others their age are settled or settling into retirement, Chong and Marin plan to continue touring as Cheech and Chong, as they have been since 2008, alongside Shelby. “That show will continue as long as I am able to do it,” assures Chong. They’re also in the “infancy stage” of developing a new film. But these days, with less urgent need for a Cheech and Chong to point out the hypocrisy of marijuana laws, there is a safe, golden oldies element to their act. “Now, there’s no paranoia,” says Chong. “We don’t have an antagonist. We don’t have a whole society looking down on us because we are brown guys smoking weed. It’s the opposite. Now, we are saviors.”For dispensary locations and additional info, visit chongschoice.com as well as the Chong’s Choice Facebook, Instagram, and Twitter. While you’re at it, watch Tommy on First We Feast’s Hot Ones here.